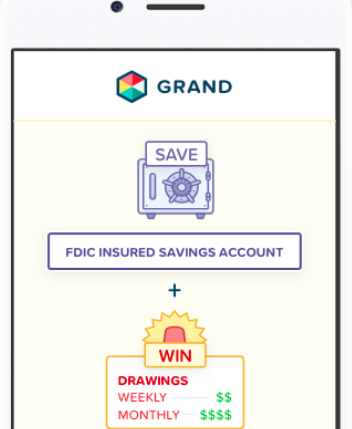 US-based Grand​ has entered our fintech land with a prize-linked savings and investment service. The start-up says it wants to “make saving money fun through a unique prize-linked savings approach”. It intends to do this by incentivising consumers to make financially savvy decisions, such as putting away money in a savings account, “in exchange for the chance to win life changing weekly and quarterly cash prizes”. In conjunction with the launch, active users are immediately entered to win a cash prize of $25,000. The company cites US Federal Reserve data, which says the average American has less than $4,000 in savings, and about 57% of Americans have less than $1,000 saved. This is where Grand reckons it comes in as its solution “marries both of these issues”. It provides a website and mobile app. Consumers link their checking account to Grand and can begin saving, with the option to automate an amount to save weekly, or manually saving whenever they want. The money is transferred into Grand’s account, which protects users’ information through “bank-level encryption”. It is free for the first month. Following the trial, it charges $2/month. Every week, active users are automatically entered to win cash prizes, with each dollar saved counting as an entry to win. Winners are selected at random and cash prizes are automatically deposited into their Grand account.